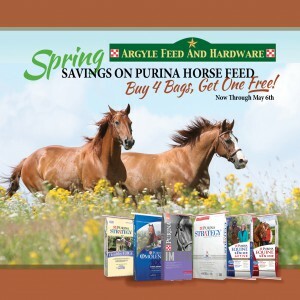 Now for a limited time through May 6th, take advantage of this great deal on select Purina Horse Feeds at Argyle Feed & Hardware! Buy any four bags of Purina Omolene, Equine Senior & Senior Active, Strategy & Strategy Healthy Edge as well as Purina Impact formulas and get one bag FREE. This opportunity to save on Purina Horse Feed is one of the best deals of the year for great savings on the best quality equine feeds. Mix and match any five equal size bags of select Purina Horse feed products to receive discount; offer good now through May 6, 2016. All rules and restrictions apply. Purina horse feeds and supplements start with state-of-the-art research and high-quality ingredients. Purina provides nutrition solutions for every phase of your horses life and health needs, from foal to senior horse. Not sure what Purina horse feed is right for your animal? Use the Purina Horse Feed finder to help you determine which feed is right for your horse. This entry was posted on Tuesday, April 19th, 2016 at 5:20 pm	and is filed under Events, News & Updates. You can follow any responses to this entry through the RSS 2.0 feed. Both comments and pings are currently closed.